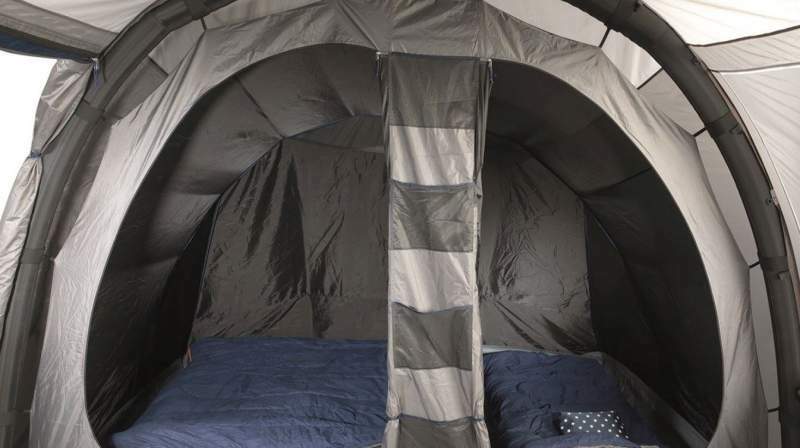 This Easy Camp Tempest 500 Inflatable Tunnel Tent is without solid poles, with three rooms and PVC windows, and a huge waterproof rating for full protection against elements. Easy Camp Tempest 500 Inflatable Tunnel Tent. Air beams instead of poles. This Tempest 500 is available on Amazon. I have found it in most of their global stores, so follow the link and find it in your local Amazon store and you will save on shipping. From what I have seen, there are different versions around, the difference is in the number of PVC windows. Surprisingly, the Amazon-US price is around 1/3 of the price which you can see on the manufacturer’s site. Not sure if this will remain so and why this is so. Here you have a tent without any classic pole, you have inflatable air beams instead. So pitching this tent is easy with the included pump and one person can do this in a couple of minutes. This is a part of the series that also includes a 6-person tent. So what you have here is a 3-room structure. It includes a sleeping area with two asymmetric rooms and this is a tent within the external shell tent, and the front living area which is a bit bigger. The divider between the two rooms is just a curtain and it is removable. I have included it in my list of 3-room tents. Note that the shell tent is with a durable and completely sewn-in and sealed floor, and the inner tent has its own floor as well, so you have two waterproof layers in the sleeping zone. The tent is not freestanding, this is typical for most of the tunnel tents on the market. So bear this in mind, at least the front and the rear side must be staked down to have the tent upright. Capacity: the declared capacity is 5 people, so let’s see what the tent offers. The total protected area is around 142 ft² (13.2 m²), this includes 5.77 m² in the sleeping zone and 7.44 m² in the living area. The effective area is a bit bigger as you realize from the picture below, there is space between the inner tent and the shell, this is rather wide and good for ventilation. In any case, you have at least 28.4 ft² (2.6 m²) per person and this looks like a luxury to me. The floor plan and some dimensions. The 3D sketch with the position of windows and some numbers. Climate-wise & seasons-wise, the tent is fully enclosed with its PVC windows and the sealed floor. The waterproof rating is also very high. So I see it best suited for a cooler environment rather than a very warm climate. 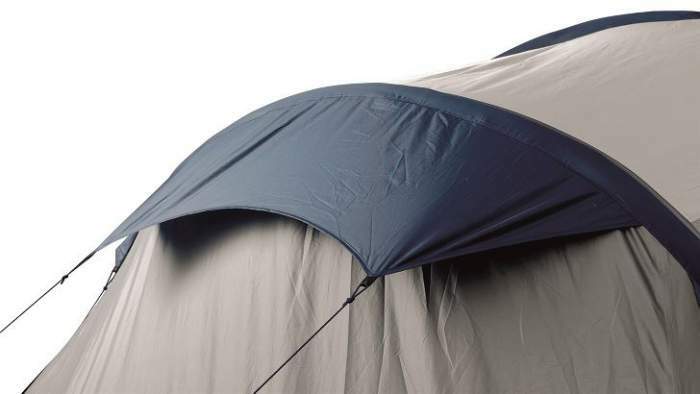 But in general, this is a 3-season tent which offers full protection from elements and from insects. Weight: With its 31.5 lb (14.3 kg), this is a heavy item, but you will see later that this is a quite good number for such a type and size, there is a comparison table below. The packed size 29.5 x 17.3 inches (75 x 44 cm) is not so great but in any case this is a tent for places with motorized access, you are not supposed to carry it long distances. So you have seen this already, there are no rigid poles of any kind here. You have 3 air tubes instead, and a two-way pump with a manometer for fast inflation that comes in the package. You have external inflation valves, one is shown in the picture below. The inflation valves are outside. So you inflate the beams from outside and the tent raises with the inner tent preattached. This is very convenient when you have to set the tent up in rain, the inner area will remain completely dry in the process. This is not so if you have a tent with a separate fly which is added above. It would be appropriate to call this an instant tent because the setup is easy and fast. But I have included it in my list of best inflatable tents. The shell is a 190T 100% polyester with PU coating and it provides 3000 mm waterproof rating. The bathtub floor is 100% polyethylene, thick and sturdy. The same material is in the inner tent’s floor. So you have a complete protection from water. The inner tent is a breathable polyester. The tent can be used without the inner tent of course, in this case just unclip it from the walls, see the picture below. View inside – the inner tent with two doors and storage pockets. There are 2 external doors and 2 inner doors. The former has no mesh, only panel is there, pity. The inner doors have mesh sections in the upper areas. There are 3 PVC windows as well, one large on the side and two smaller on the front. Yet another great feature is that you can make the entry area floor completely flat (this is in the picture below). So your kids will not be catching it by feet and tripping over it, this is also nice to have if there is somebody with a wheelchair using the tent. The entry floor can be completely flat, there are short zippers to open, and rings to stake the floor down. There are no mesh areas on the shell, so the tent relies on vents. You have them on the side and on the back (shown below) and they are with mesh for protection against insects. But there are not many of them and this might not be enough if you have to keep the doors closed either because of rain or because of insects. So as I said above, it is better suited for a cooler climate. 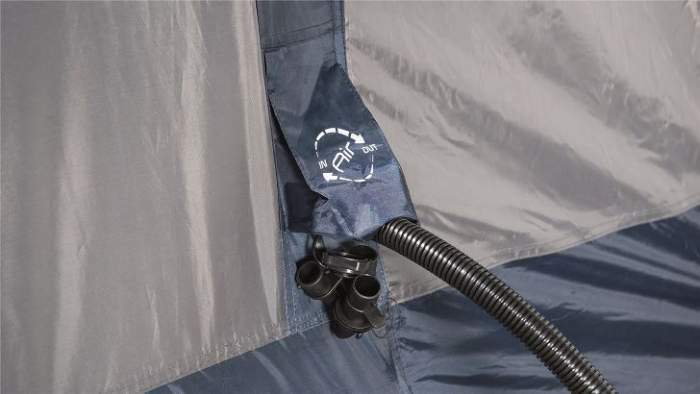 The vent on the rear side of the tent. There is a zippered cable entry port above the floor. Guyline retainers hold folded guylines securely when packing away. The entry doors without a mesh. A bit heavy and bulky. 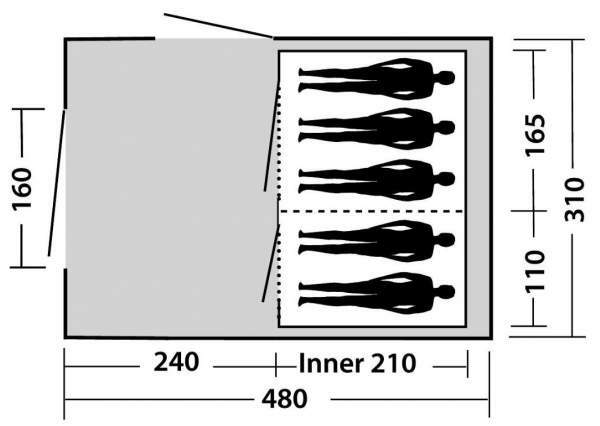 Type: tunnel-shape air beam tent. Weight: 31.5 lb (14.3 kg). Dimensions: 189 x 122 in (480 x 310 cm). Area: 142 ft² (13.2 m²). Area per person: 28.4 ft² (2.6 m²). Packed size: 29.5 x 17.3 in (75 x 44 cm). In the table below I show this Tempest 500 tent side by side with two 5-person tents by Vango, both inflatable type. This might help in better understanding the feature of this tent. As you see, it is lighter but it offers less space although indeed it is so large. So as you have realized, this Easy Camp Tempest 500 Inflatable Tunnel Tent offers more than enough space for the declared number of users. It is perfect for families and groups of friends seeking a reliable and versatile tent. It is a pity they did not add mesh on at least one of the entry doors. Please check my list with inflatable tents if you want to see more options without classic poles. If you would rather have classic poles, check this Ferrino Proxes 6 Family Tent which is for 6 people and also with 3 rooms. Note that this is not a sponsored text and I am not paid by the manufacturer. Let me know what you think about this tent, there is a comment box below. Have a nice day. The Easy Camp Tempest 500/600 series wasn’t on the list of “Dark Rest” tents, but it appears the inner tent is made of darker material. Perhaps it’s a bit of lighting and photography, but it appears it might be somewhat darker to sleep in than most tents that don’t advertise as “dark rest.” What would you say? Dark rest is not as important for me as being more comfortable in chilly desert nights (when I camped out in July in the Central Oregon desert at 4500 feet/1370 m, temps hovered around 40 F/4.5 C), but it wouldn’t hurt, either. Hi Joe, no it is not in the group of dark rest, but you are right that some of those that are advertised as ‘lights-out’ type are not so dark. For such temperatures, you would want to have something that is enclosed like this tent because of its solid windows. All the best.